Unless you haven’t been paying attention to your Facebook newsfeed or Whatsapp groups, you would have probably seen this video making its rounds. A quick background, this earworm is brought to you by Piko-Taro, one of the personas of Japanese entertainer Kazuhiko Kosaka. 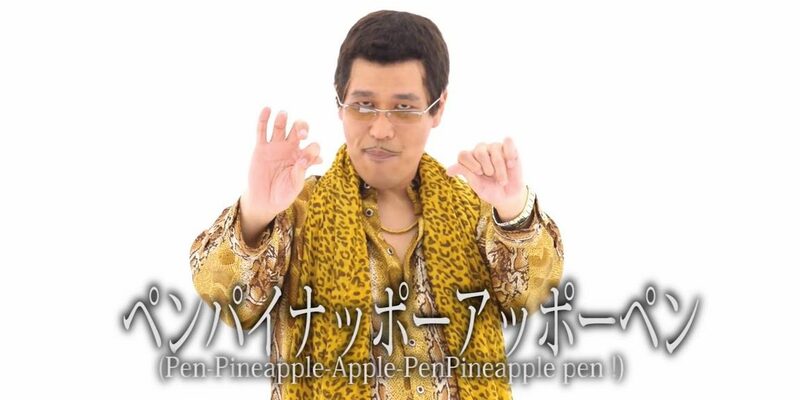 Titled Pen-Pineapple-Apple-Pen (PPAP), the title basically reveals everything there is to the song. Its lyrics are deceptively simple, there doesn’t seem to be a clear purpose to his actions, and it’s all around slightly goofy and perhaps a tad sexual, if your mind strays towards such things when you watch his gestures. Normally, I take the angry-hater stance on such videos, mainly because they’re played to the point of over-saturation, but this time, I’m oddly fine with this song. To be fair, I’ve never been a big Hallyu fan, so having a Japanese comedian worth his salt make the world sit up and take attention is exactly what the Internet needs. For the haters and detractors, compare this to Yvlis’ much more annoying “The Fox (What Does The Fox Say? )” or the Psy song I’m not even going to bother to link here. PPAP is lighter, happier, and more importantly, shorter. With the right mix of incomprehensibility, quirk and simplicity, his kickass leopard print scarf tying everything nicely together, he looks set to be the next “foreign” act to take the world by the storm. Not only are the lyrics simple and easy to sing along to, he even kindly provides the subtitles. If you can’t get enough of it, here’s a 5-minute video compilation of various people dancing along to the song. For fans, you can even learn the dance in a follow up video he’s posted recently, where he breaks down all the moves and shows you exactly how to hold that pineapple. As annoying as you may find it, even if it receives as much airplay as previously viral songs, it’s only about a quarter of the length, being around one minute long. There’s worse things to listen to and there’re worse things that could be trending. Remember Nyancat? You’re welcome. I’m only just thanking the heavens that I no longer work with kids, and thus won’t be subject to a thousand daily renditions of this in overly high, shrill voices. So enjoy this trend while it lasts, until the world spins on to the next big thing.